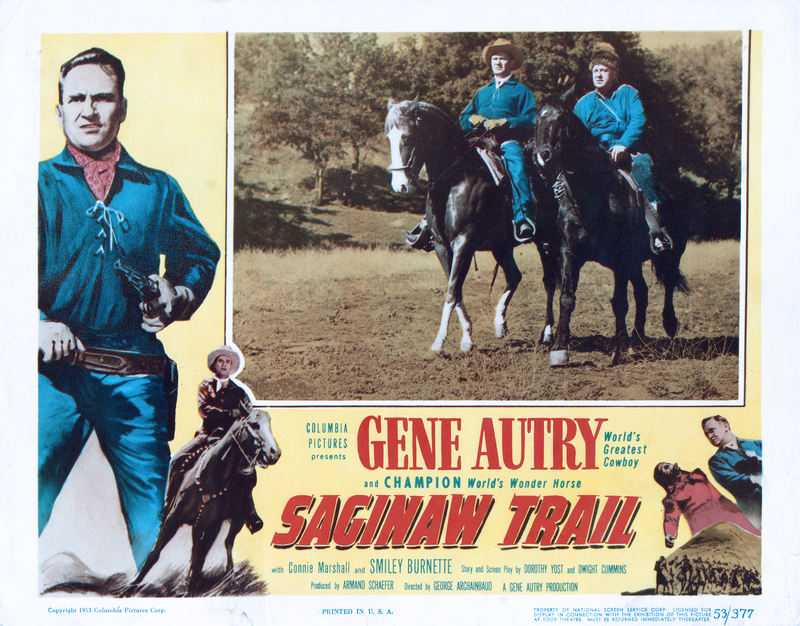 SCVHistory.com LW3177 | Melody Ranch | Lobby Card: Gene Autry Stars in 'Saginaw Trail,' Columbia 1953. Gene Autry stars with his horse Champion and sidekick Smiley Burnette in "Saginaw Trail" from Columbia Pictures, filmed on location at the Monogram Ranch in Placerita Canyon and released September 20, 1953, about the time Autry bought the ranch and renamed it Melody Ranch. "Saginaw Trail" also used locations up the road at the Walker Ranch and elsewhere in Placerita Canyon. Autry sings "Beautiful Dreamer" and "When It's Prayer-Meeting Time in the Hollow" in this film that he executive-produced, while Burnette sings a number he wrote himself, "Mam'selle." The real Saginaw Trail is in southeastern Michigan. It started out as a foot trail that was left behind by Sauk Indians, an Algonquian people, when they were driven out of Michigan (into Wisconsin and eventually to Indian Territory, i.e., Oklahoma). The footpath ran from present-day Detroit to Saginaw through Pontiac and Flint. Paving — with wooden planks and/or whole logs — began in 1818 by vote of the Michigan Territorial Legislature; federal funding aided the effort in 1827. Alexis de Tocqueville rode the trail in 1831. In the 20th Century it morphed into a state and federal highway. In our film, Gene's job is to prevent Indians from attacking white settlers. George Archainbaud	directs this Armand Schaefer production. Rounding out the credited cast are Connie Marshall, Eugene Borden, Ralph Reed, Henry Blair, Myron Healey and Mickey Simpson. Uncredited cast includes Gregg Barton, Charles Hayes, Ann Kunde, Ethan Laidlaw, Frankie Marvin, John Merton, John Parrish, Rodd Redwing, Charles Soldani, John War Eagle and William Wilkerson. Further reading: Melody Ranch: Movie Magic in Placerita Canyon. LW3177: 9600 dpi jpeg from original lobby card purchased 2017 by Leon Worden.